Germany‘s first trial involving the Rwandan genocide began Tuesday, as an asylum seeker�appeared before a court in Frankfurt. Onesphore R., a former Rwandan mayor, is accused of organizing three massacres in which over 3,700 Tutsi were killed after seeking refuge in churches. He stands trial on charges of murder, genocide and incitement to both. “R. was a wheel in the cogs of the genocide,” Dominic Johnson, Africa correspondent for the German daily taz told Deutsche Welle. via German court opens Rwandan genocide trial | Germany | Deutsche Welle | 18.01.2011. Nazi Germany’s relentless campaign of nightly bombing British cities – London, above all – throughout the winter of 1940-41 has passed into British legend as the Blitz, so called from the German Blitzkrieg (“lightning war”). The Blitz was the first attempt in history to cripple an enemy’s war economy and break the morale of the people by bombing. The Blitz on London began even before the Battle of Britain had been finally won by RAF Fighter Command. Between 8pm on 7 September and 4.30am the next morning, some 250 German bombers homed in on raging fires already started by an earlier daylight raid. Two nights later, the bombers came again, running a “shuttle service”, lasting nine-and-a-half hours, from their bases only some 60 miles away in northern France. Railway termini and telephone exchanges were put out of action. Huge new fires were started around the London docks and in the City of London. The close-packed houses of the East End were smashed by high-explosive bombs or burned down by phosphorus firebombs. In these two initial raids alone, nearly 850 civilians were killed, and more than 2,000 seriously wounded. So was set the grim pattern that would be repeated almost every night during the long winter months. The pattern shaped my own life as a 13-year-old schoolboy living with my family in the south London suburb of Norbury, and under the incoming track of bombers. We heard the sirens wailing their evening alarm; we took precarious shelter under the stairs; we listened to the heavy throb of German aero-engines; we heard the anti-aircraft guns banging away blindly into the sky; we froze at the whistle of a falling bomb; we felt the house shake at the near misses; and in the morning after the “all clear” we looked to see what had happened in our own road. In climactic raids on 29 December 1940 and again on 10 May 1941, the Luftwaffe started colossal conflagrations in central and eastern London, causing the first-ever firestorms in which the sheer heat of combustion sucked in gales of wind to create roaring furnaces beyond the power of hoses to quell. From the attic window of our house on these nights, you could see the whole northern horizon over London glowing bright orange. It was during the raid of 29 December that St Paul’s Cathedral narrowly escaped destruction from the surrounding fires – a moment captured for ever in the now famous photograph of the dome of St Paul’s silhouetted against the flames. Yet all too soon the Luftwaffe high command extended the Blitz to other great British cities, especially the ports and centres of war industry, including shipbuilding. In major raids between November 1940 and May 1941, Sheffield and Manchester were each attacked twice; Belfast, Portsmouth and Southampton each three times; Hull and Clydeside each four times; Birmingham and Liverpool (with Merseyside) each seven times. At a time when RAF Bomber Command still relied on night navigation by the stars, the Germans were employing a radio beam to guide their bombers to their targets. A cockpit alarm warned the pilot whenever his aircraft had drifted off the beam. It was this device that enabled 400 Luftwaffe bombers to tear the heart out of Coventry on the night of 14 November 1940, destroying the medieval cathedral. The codeword for the raid, “Moonlight Sonata”, had been decrypted by the government’s code and cipher centre at Bletchley Park from a signal of the Luftwaffe’s “Enigma” electro-mechanical enciphering machine. Unfortunately, Bletchley Park could not identify the actual city to be attacked. Yet the raid failed to destroy Coventry’s motor vehicle and engineering factories, which lay on the city’s outskirts. In fact, the Blitz as a whole failed to inflict serious damage on the British war economy, even though the Luftwaffe had its local successes, as when an attack on a plant making magnetos slowed up output (and hence production of engines) for several months. Even where war factories took direct hits, the impact on production was minimised, thanks to emergency repairs and replacement kit – and, above all, to the resilience and ingenuity of the British workforce in the aftermath of the air raids. In one case where the roof of a factory had been destroyed by fire, the workers carried on under the open sky for two months, covering their machine-tools with a tarpaulin when it rained. Although the savage attacks on the port and shipyard cities reduced central districts to rubble, they failed to inflict truly crippling damage on wharves and docks. With foodstuffs and vital supplies of raw materials (and North American machine-tools) continuing to be unloaded, the nation would not starve and its war industries would not slow to a halt. So Reichsmarschall Hermann Göring was disappointed in his beliefs that his bombers would bring Britain’s war industry to a standstill. He was likewise disappointed in his belief that he could break the morale of the British people. Certainly, there were localised moments of panic, when a public air-raid shelter was hit. But the Blitz actually served to stiffen British morale: it brought the nation together in a community of resistance to a dictator they despised and ridiculed. The close-packed streets of working-class districts had always been communities. But now households living in the semi-detached houses of leafy suburbs began to reach across the privet hedges to their neighbours, to offer succour after an air-raid or an egg from a newly acquired chicken. My parents had virtually nothing to do with their neighbours in peacetime. Now we found ourselves spending the winter of the Blitz in our neighbour’s cramped concrete air-raid shelter after a shared supper. For others, the Blitz served as a liberating experience, as in the case of the spinster lady in our road who became an ambulance driver, undaunted by the crash of bombs and the clatter of falling shrapnel from burst anti-aircraft shells: a lady well able to cope with the dead or maimed bodies pulled from the rubble of a collapsed house. All branches of Civil Defence (as it became known in 1941) played their parts. The firefighters (regular and volunteers of the auxiliary service) grappled with “hundred-pump” blazes for 40 hours at a stretch. In one raid in London, no fewer than 1,724 fires were started, and the firefighters’ task was rendered all the more desperate when water mains were smashed by bombs. Every house and every major building had its firewatchers, the first defence against the Luftwaffe’s incendiary bombs. Our house – like everyone else’s – was equipped with its bucket of sand and long-handled shovel. It was the firewatchers in the roof of St Paul’s Cathedral who spotted and successfully dealt with the firebombs that could have destroyed it. And every street had its air-raid warden, also a civilian volunteer. They were usually the first on the scene of a bombing, and it was their job to report the location and details to the district control centre. That was the signal for the back-up services – police, ambulance, rescue – to move as fast as rubble-strewn roads or burning buildings would permit. The sound of anti-aircraft gunfire would be cut through by the clanging of the bells on fire-engines and ambulances. And doctors and nurses in the overstretched hospitals toiled long hours to save the wounded. When the Blitz came to its end in May 1941, the Luftwaffe had dropped on London alone a total of nearly 14,000 tons of bombs. Yet it had utterly failed to terrorise the people. Except during an air raid itself, the trains, trams and buses still ran; the theatres and cinemas stayed open. The cafés and restaurants did good business, even if the customers had to duck under the tables from time to time. All the Blitz had done was to pull the British nation together in a resolve that Nazi Germany must, and would be, beaten. In the words of the future commander-in-chief of Bomber Command, Sir Arthur Harris, as he watched the fires burn around St Paul’s: “They sowed the wind, and now they are going to reap the whirlwind.” And they did. The Luftwaffe’s total of 74,000 tons of bombs dropped on Britain was utterly eclipsed by the nearly two million tons dropped by RAF Bomber Command and the US 8th Air Force by the end of the war in 1945. Berlin and other great German cities were reduced to burnt-out hulks of buildings and heaps of rubble. And yet although allied bombing certainly slowed the growth in war production, it failed to bring it to a standstill. And the German people’s morale did not crack. There is a lesson here which today’s proponents of “shock and awe” through airpower have not heeded. 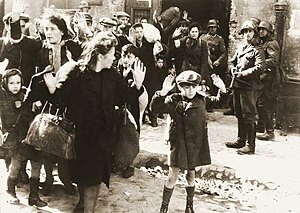 Children in the Lodz ghetto during World War II. Germany approved the requisite legislation back in 2002, but many of those who worked in Jewish ghettos during World War II are still waiting for their pensions. Indeed, up to 90 percent of applicants have been rejected. Now, though, a new reading of the law could break the logjam, and cost Berlin up to 2 billion euros. 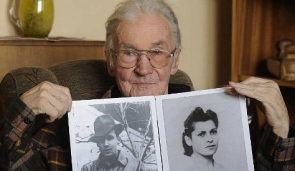 Abraham Leibenson, born in 1925, was a construction worker from the Lithuanian city of Radviliskis who was imprisoned in the Stutthof and Dachau concentration camps during World War II. His entire family perished in the Holocaust. Leibenson later moved to the Israeli city of Bat Yam, just south of Tel Aviv. He suffered from heart trouble and had very little money. In the summer of 2002, Leibenson heard about a new law that had been passed by the German parliament. It promised a modest pension to Jews who had worked a regular job in the Nazi ghettos. Leibenson had been employed in a number of positions in the ghetto of the city of Siauliai, working in agriculture, railway construction and at a nearby airfield. He submitted an application to the appropriate authority, the regional German state pension agency in Düsseldorf — and received a rejection notice. He filed a complaint with the Social Court in Düsseldorf — and lost. He appealed to the State Social Court in Essen — and lost again. Finally, he lodged an appeal with the Federal Social Court in Kassel. That was last year. On Feb. 18, 2010, Abraham Leibenson died at the age of 84 without receiving a cent from the German state pension scheme. "He was extremely disappointed," says his widow, Ettel Leibenson, "but that's probably their policy — to wait long enough for them all to die, so it costs as little as possible." Germany's so-called Ghetto Pension Law (ZRBG) was designed as an unbureaucratic and swift measure to close a gap in the country's Nazi-era compensation — at least that's what proponents of the bill intended in 2002. But the opposite has occurred. State pension agencies have denied over 90 percent of the roughly 70,000 applications submitted to date. "Every day 30 to 35 survivors die," an Israeli government delegation told representatives of the German Ministry of Social Affairs last Wednesday. Nearly half of the applicants live in Israel. Government insurance bureaucrats and judges in the state of North Rhine-Westphalia are largely to blame for the high rejection rates. They have been assigned the cases of claimants living in Israel. When in doubt, they interpret the law in a way detrimental to the survivors. Even though the law refers to "remuneration" rather than salary, applicants have been rejected if, for example, they received food stamps for their work. Officials have also cast doubt on whether they worked "of their own free will," as it is formulated in the law. Many applicants have been erroneously classified as forced laborers, although lawmakers in Berlin very deliberately separated the current legislation from forced laborer compensation. Historians were rarely consulted at the outset. State pension officials and judges preferred to rely on superficial reference works, like the Internet encyclopedia Wikipedia, as a basis for their decisions. In many cases, they even maintained that there had been no ghetto in the city in question. They often relied on a database maintained by the Karl Ernst Osthaus Museum, located in the western German town of Hagen. The museum documents just 400 ghettos in Eastern Europe — but the Russian historian Ilya Altman has counted 800 ghettos in just the region encompassing the former Soviet Union. The rulings reached by the retirement insurance authorities and the judges are "in most cases poorly substantiated or totally unsubstantiated," Stephan Lehnstaedt, of the German Historical Institute in Warsaw, wrote in a report. They "demonstrate the lack of a qualified approach to scientific literature and historical sources, even an appalling ignorance at times."